V is an anarchist freedom fighter in dystopian London who tries to incite a revolution by performing various acts against the government. 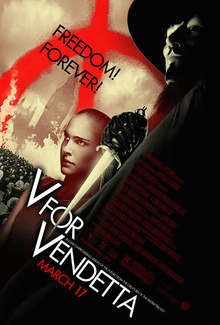 V for Vendetta was originally a graphic novel that was made into a successful movie in 2006. The V/Guy Fawkes mask has become a sort of symbol against tyranny. Listen to the 1812 Overture. Shave your head (or, okay, wear a bald cap). Use as many v-words as possible. Decide which ideas are most important to you–because ideas are bulletproof.